I don't use Fibonacci's, but I remember reading something in Tim's blog saying it's 50%. From it's move down, it's actually crossed above the 50% range because that would've been at 1492.50. It's actually 50% of the move if it were to go all the way back up and follow the resistance trend line. Could this possibly be a pivot point? Sure. However, today's candle (and I do not trade on candles) is not a hesitation candle, but a rather strong bullish candle. It ended the day really bullish, where buyers came back in after some pullback. 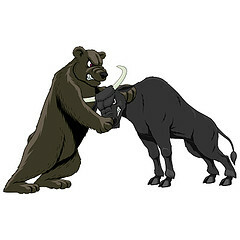 Indicators such as RSI, MACD, Momentum show it's way oversold and heading to the upside. Cashflow is also increasing. It looks like there is room to move to the upside and it would be nice for it to see it hit the upper trend resistance line. 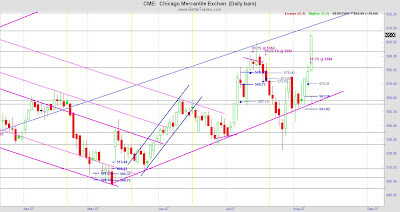 I'm in bullish for CME. Got in around 565 for Aug570C, slightly OTM. Lately I've been liking to get ATM or slightly ITM due to more cash in my pocket, though, a bigger outlay in capital and less of a ROI. That's okay with me. This chart is a little off in that it has some after hrs data on it and shouldn't. Hopefully Genesis will correct this tomorrow. I would love to see this go up to hit the upper trend support at 610. That would put me $40 ITM, making probably my option worth $45-49 depending upon volatility and when I get out. Not bad for a few days trade. My option was $11.70. Got in a little earlier as it pulled back a little after I got in. A better price for that option would've been in the $8-9 range. My original target was $600, which still puts me $30 ITM, making the option about $36-39 if it does this tomorrow. That would be a 200% return in 4 days. Nice. I got in around the $134-135 range yesterday. 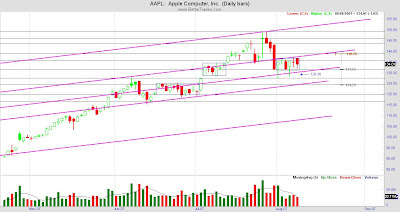 One of the things was my AAPL chart had a lot of lines. When I erased all the lines and redrew, I saw a slightly different picture than what I saw when I got in. Going to give it some room to work, as it seems to be in a compression pattern with a couple days of long wicks. 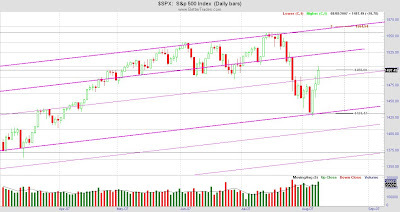 I'm keeping my stop below the pink support trend line. Since I'm watching this, I will stop myself out if it strongly moves through my stop. Got out of my RIMM trade yesterday and today it gaps up. RIMM rarely likes to leave gaps and later in the day came to fill the gap up at the beginning of the day. 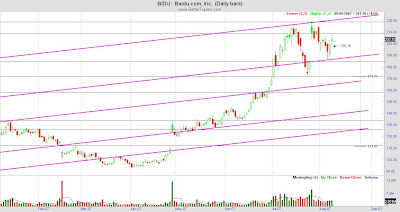 Today it broke above the rectangular compression pattern, but in the end, it looks like a doji, which means indecision. It can't decide whether it wants to march forward or not. I will give it some room to work tomorrow, however, I'm not about to let it go too far and will be ready to switch to puts if it decides to go back down to the $213 range. It makes no difference to me whether I'm a bull or a bear. My goal is to be profitable consistently, and I have no ego. If I'm wrong, get out and change directions. It's that simple. 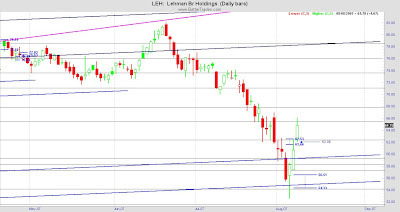 LEH is my favorite of the investment stocks to trade. My trading coach likes GS. Other people like BSC or MER. LEH's options are often fairly priced and though the movements are similar in all the investment stocks, this has been the one stock that I've been able to consistently be profitable on, whereas, it's iffy with GS or BSC. MER I've never done any funded trades on this so I cannot speak. For me, LEH and I have learned to dance fairly well, at least when it moves. Earlier this year, I was not trading LEH because somehow I lost sync with this, but when I saw it had taken such a tumble, I decided to visit LEH again. My entry was set a little too close and I got taken in too early. As I saw 2 support trends nearby, I kept my stops fairly far away to give it room to work, in case I was wrong, but I figured at some point it would reach a bottom. The smarter thing to do was to have kept a tighter stop, get out with a slight cost and reverse directions for the 8 points it came down. That's a lotta points when the stock is not that much. My error. This trade is now well in the positive. Let this be a lesson learned. This could've been a far more profitable play had I reversed positions twice, making double the money. Right now I'm giving it room to work. 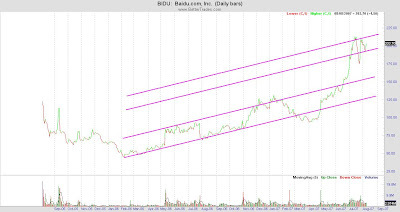 This is the overall trend of BIDU. 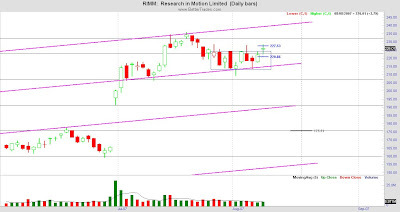 Notice the angle of attack for most of the stock as been at the same angle. Interesting, eh? Once again, my other chart just had too many lines that it was hard to see. Erased them all and redid the chart and voila. As I switched to candlestick view, you can see I adjusted the lines a little bit and added an additional trend line to help me better see what is going on. My RSI/MACD indicators shows iffy to move upward as it does look oversold, but it could possibly continue bearish. HOWEVER, my other indicators (momentum, cashflow, Adaptive Moving Average) show bullish. Anyhow, my position here is a strangle from earnings. I'm still in the negative for the Aug230C, but it's becoming less negative. I only have 1 contract. So, we'll see. The horizontal lines are some of the targets and my stop in on the chart. It has good volumes.